Lonis Tattoo Studio - House of Art has been operating since 2009 at 1-3 Lekanidi Street, Agios Dimitrios, near Athens Metro Mall. It is a stylish and highly professional space that overflows with art; decorated with paintings, murals and graffiti by the tattoo artists of the studio and with high hygienic standards that ensure your personal hygiene. The team consists of Lonis (tattoo artist), Sinke (tattoo artist), Thanassis and Antigoni (shop managers). Having participated in various European tattoo conventions and won awards in many categories, Lonis Tattoo Studio - House of Art offers tattoos with high quality and aesthetics at the best market prices, always respecting the motto of the studio, "The devil is in the details.". In the shop there are also tattoo aftercare products, t-shirts and a wide variety of body jewellery. 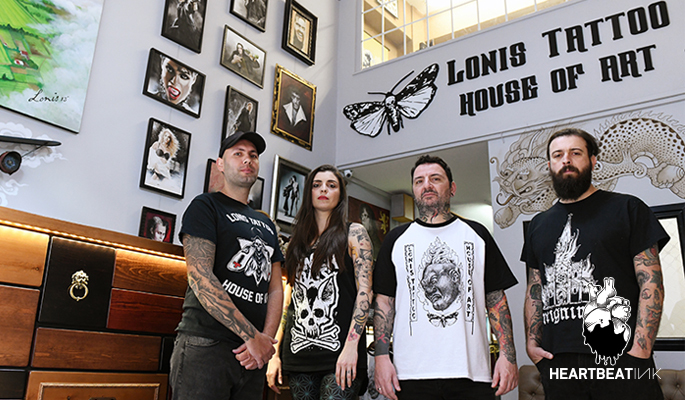 Lonis Tattoo Studio - House of Art Info HERE. Words by Lonis Tattoo Studio - House of Art. Crew & studio photos by Ino Mei. Leonidas Skiadas (Lonis) is a professional tattoo artist since 1999 and founder of Lonis Tattoo Studio. He does all tattoo styles with particular love in Realistic Colour and Black & Grey, as well as in Asian and Oldschool tattoos. Konstantinos Michelis (Sinke) has been doing tattoos professionally since 2011, covering all the tattoo styles with specialty in Realistic Black & Grey, Geometric, Oldschool and Blackwork.